Angelique Eberwein is a graduate of the Colorado Institute of Massage Therapy (CIMT), a Colorado Springs, Colorado, massage school specializing in pain relief. CIMT provided a well-rounded education, with extensive hands-on training as well as an emphasis in anatomy and physiology. Through the 1,150-hour program, Angelique received certifications in neuromuscular therapy and trigger point therapy. She has also been trained in myofascial release techniques; sports therapy; Swedish, deep tissue, scar tissue release; hot stone and prenatal massage. Angelique’s ongoing education includes advanced medical massage therapy from leading therapists and international instructors. In October 2012 she completed a year long program and received a certification in Neurology for Bodyworkers. "With this certification, I have achieved a better understanding of the relationship between the brain, nervous system and body. I have learned to identify which techniques in my 'tool box' will be most helpful to the individual, and ways to instantly view feedback that tells me if the work I am doing is helpful or harmful to the clients specific needs." Most recently, Angelique completed a certification in Contemporary Cupping Methods from the International Cupping Therapy Association. This modality has been so valuable, Angelique took the Advanced Cupping Techniques class in October 2018. "Since incorporating cupping into my treatments, I have seen some incredible results. Clients have reported longer lasting results, better sleep, less pain, improved range of movement, and generally like the suction of the cupping technique over the 'pushing' in massage". She also works with chiropractors and physical therapists to help clients’ recovery. Angelique’s goal is to help you listen to your body, read its signals, restore balance and make you healthy once again. When Angelique isn't treating clients, she enjoys working out and being outside. In the winter she can be found on the ski slopes, either down hilling or Nordic. In the summer you will find her searching for water where she and her husband can go kayaking or riding their bicycles on a beautiful single track in the mountains, or on the road. 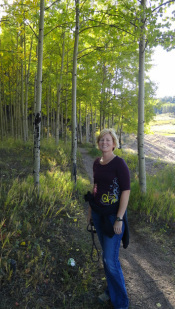 Travel and adventure are in her Dutch blood, when she isn't researching the next cool treatment modality to learn and better serve her clients.